There's a series of raises preflop and before it is over, Walter Robertson and Amanda Khamprasong have all their chips in the middle for what appears to be almost even stacks. Robertson shows Pocket_Sevens and ... oops ... he ran in to Pocket_Aces. Robertson turns a set, however Khamprasong flopped a set. The dealer counts out the stacks as Robertson starts to walk away, but he still has 30k remaining, exactly 1BB, and he's in the SB the next hand for 15k, plus a 5k ante. All in dark from the SB, Robertson's King_High holds 3-handed and he survives. Srini Godavarthy moves all in two hands later for 240,000, Robertson undershoves for 95,000, a 3rd player bumps it to 580,000 and everyone else gets out of the way. 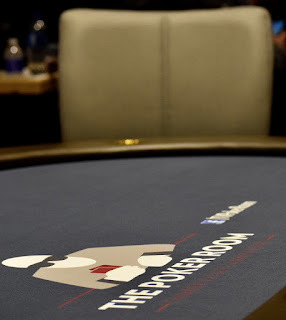 Ace on the flop, no five and Robertson cashes in 12th place for $2,972, gaining one step up the pay ladder with his King_High.